I had a lot of fun making the Maker’s Tote Pattern by Anna Graham. I hesitated a little at first when I saw that I’d need to hand sew the binding down to the from at the end, since I don’t have a lot of experience binding by hand. I wasn’t sure I’d have the patience for it, or if I’d do a good enough job. Turns out, I'm not too bad at it! 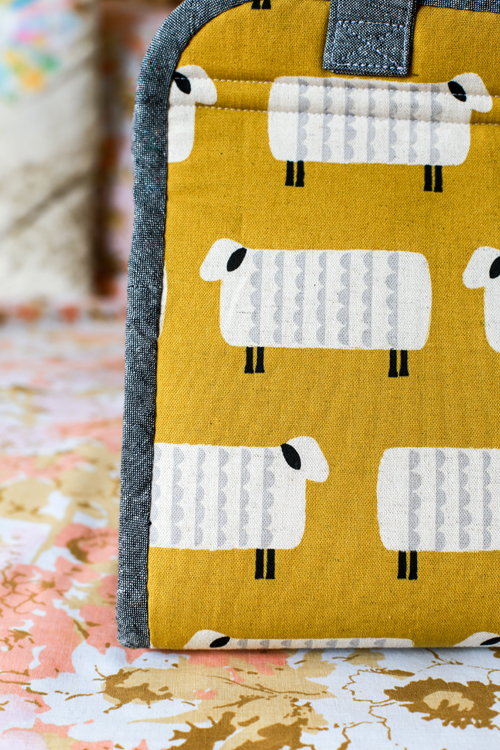 When I saw this sheep canvas from Ellen Luckett Baker’s Charms collection, I quickly snatched up a 1/2 yard of each color. They’re too cute, and I knew they’d make great knitting bags. For this project I decided on the mustard color, which is my favorite of the three. I wanted to keep the other fabrics pretty neutral. I chose a black and cream gingham from an old Sweetwater collection (not sure which), gray Heath, Widescreen in Yarrow, and black yarn-dyed Essex cotton/linen. I made a few minor modifications for my tote. I left off the front flap pocket, I didn’t want to cover up any of those sheep! I also used a non-separating metal zipper. I used a 16” zipper instead of a 14” zipper to compensate. I covered the end with a tab like in the Open Wide Pouch Tutorial. It worked out great, and still opens completely. Other than these two things, I followed the instructions to a T! Pockets are at the most risk of getting left off when I make bags. I don't tend to use a lot of pockets. For this bag though, I knew I'd definitely get use out of the interior pockets. There are slip pockets on one side and pleated pockets on the other. Perfect to hold my knitting pattern and other notions. The zippered pocket on the back will be good for stitch markers and little scissors. Things that could otherwise fall out or get lost in the bigger interior pockets. I hardly ever hand bind anything, and like I mentioned I was afraid I wouldn't have the patience for it. Honestly though, it was actually pretty enjoyable. I was able to work on it while watching TV and even while we got our car's oil changed. I used lots of wonder clips to hold things in place. A nice sharp needle and my favorite thimble and it really didn't take that long. I'm pretty darn proud of how nice it looks! Taking the time to do it by hand was totally worth it. 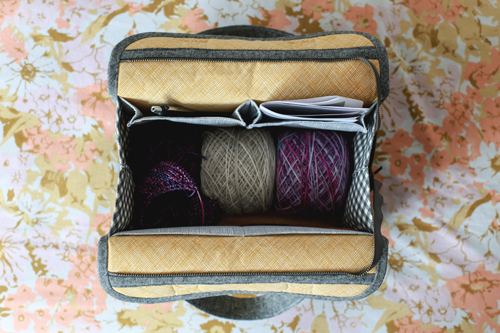 I love a good knitting bag, and this pattern really fits the bill. When open, it sort of functions as a basket. It stays open and is nice and roomy. I am able to fit three skeins of sock yarn in the small size bag, plus my project and all the notions I need. 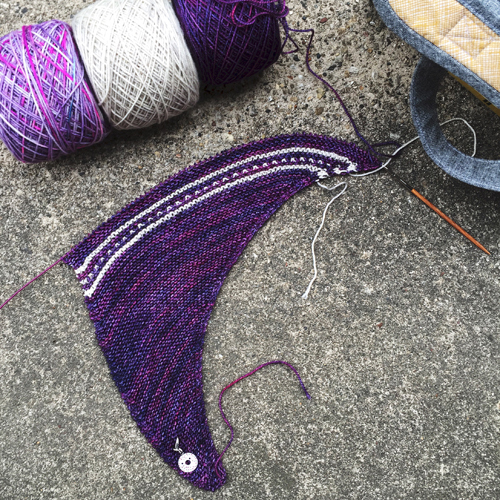 Right now I'm knitting Drachenfels by Melanie Berg. What an awesome bag. And those sheep are adorable. Oooh, yay! I'm enjoying it so far! 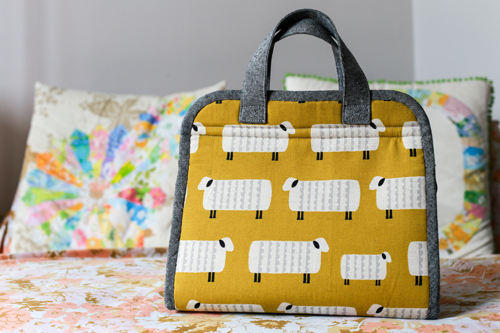 Love the bag and the sheep! Yay! It was lots of fun! This is so cute! I'm hoping to make one before I go on a road trip in May :) Did you make the small or large version? 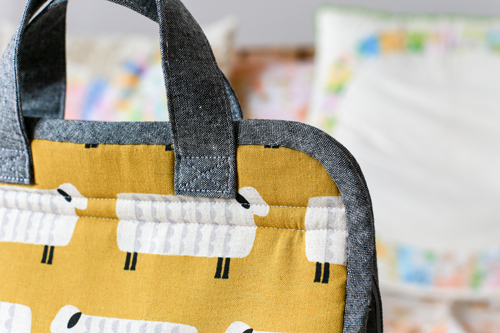 Love those cute sheep in your tote! 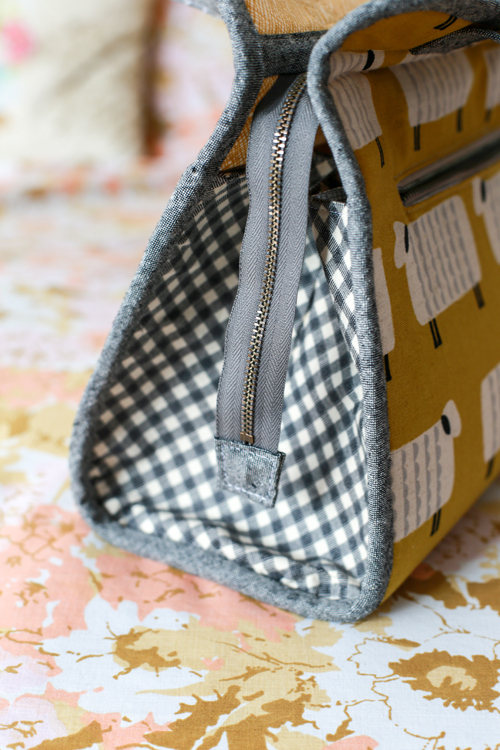 And like Debbie, I have also started sewing a Makers Tote so it was nice to read about how you made yours. Totally gorgeous! I knit a lot of socks and want to make one (or a dozen! ), but the bias binding has me intimidated. 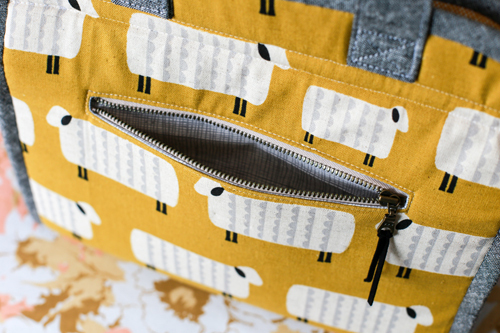 I tried to find this sheep fabric, but it is sold out everywhere online. I need to just do it and jump in---I'm sure I'll love this bag when it's done. Thank you! Honestly, the binding wasn't bad! This is just too darn cute!! You did an amazing job- it looks so professional! Love the cute sheep and the colors! Thank you, I am really happy with how it turned out! I really enjoy hand binding - though it is slow. Love your bag! It looks like the pockets would accommodate an ipad Mini. I can't knit without Knit Companion. Did you use the called for interfacings? I love how sturdy it looks! Thanks! I did use the recommended interfacings! This bag is insanely cute. Excellent fabric choices and nice job on the binding! Thank you so much for this post! 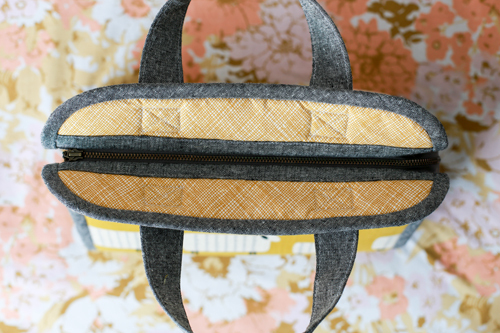 I've been looking at the Maker's Bag pattern for a while, but had my concerns about the hand-sewn binding and also wanted to use a non-separating zipper and wondered how that would work. You've given me the help I needed. This looks like the small one - right? About how long did the hand-sewn binding take? It's beautiful. Good call on leaving off the outside patch pocket. 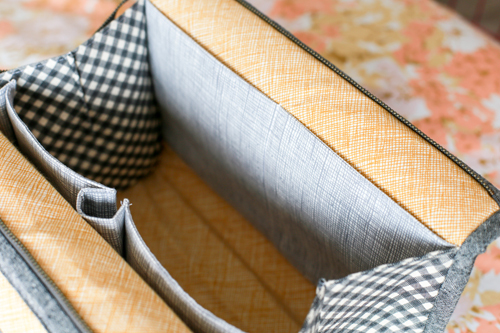 I'm thinking of adding a flat pocket that goes across the full width of the bag with edges enclosed in the binding, using the exterior fabric. Your sheep are adorable; I can practically hear them bleating. Yes, I made the small one! I'm not a hundred percent sure since I did it in a couple pf sittings, and I have almost no hand-binding experience. I think it was under 2 hours.